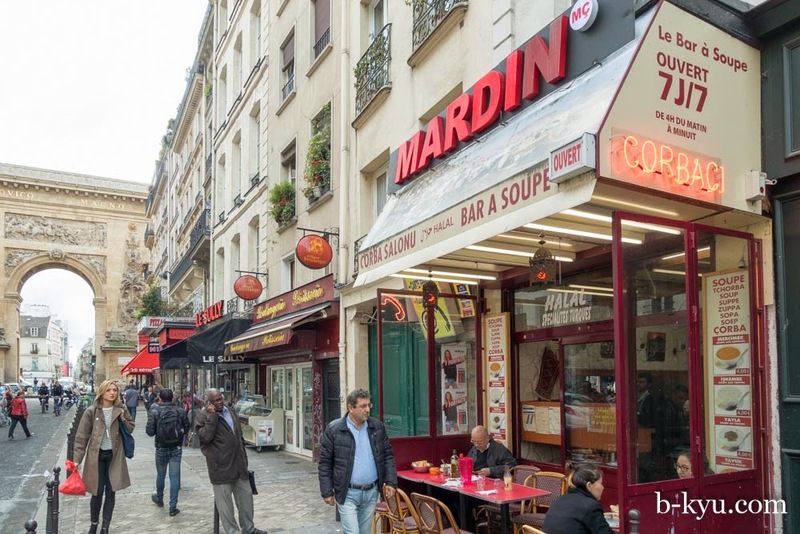 One street in Paris captured our heart and stomach like no other. 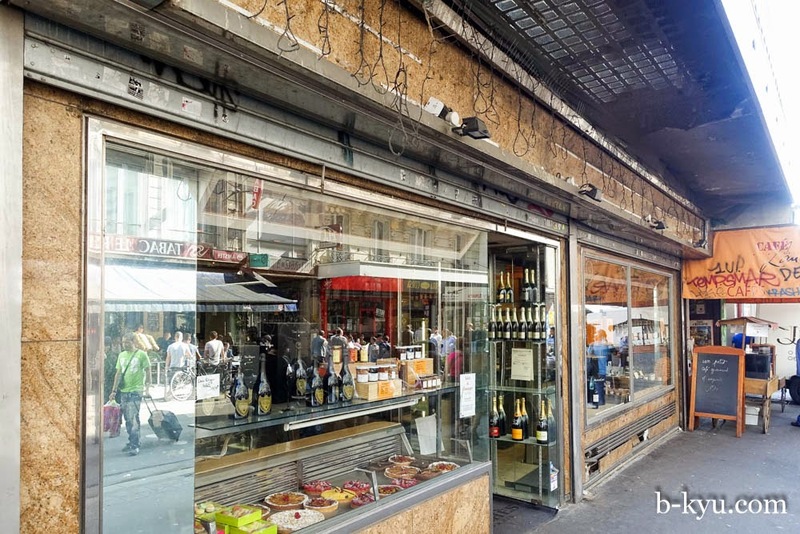 Rue Faubourg Saint-Denis mixes migrant communities and hipster food in a buzzing street in the 10th. 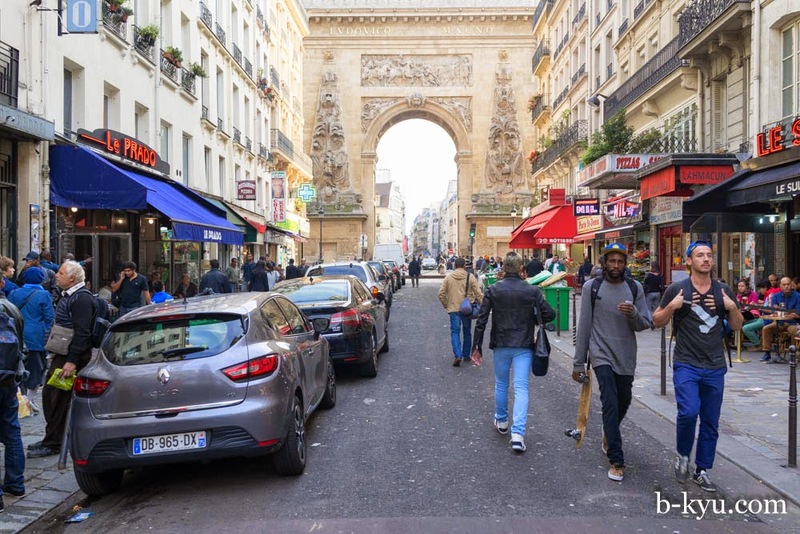 After a few days wandering the city and eating at good and average French bistros, we walked up through the 10th and to the gates at the bottom of the Rue de Faubourg Saint-Denis. 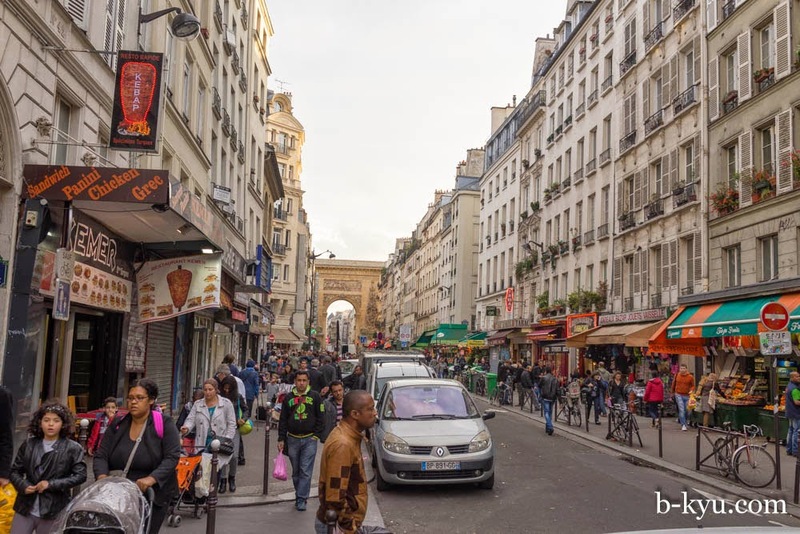 What looked like the remnants of ancient Roman conquering armies was really a gateway through to a mix of Turkish restaurants, butchers and barbers, old Parisian cafes and the birth of a new trendy district with chi-chi restaurants filling up the at-the-moment cheap spaces. This is what we wanted and we had found it. 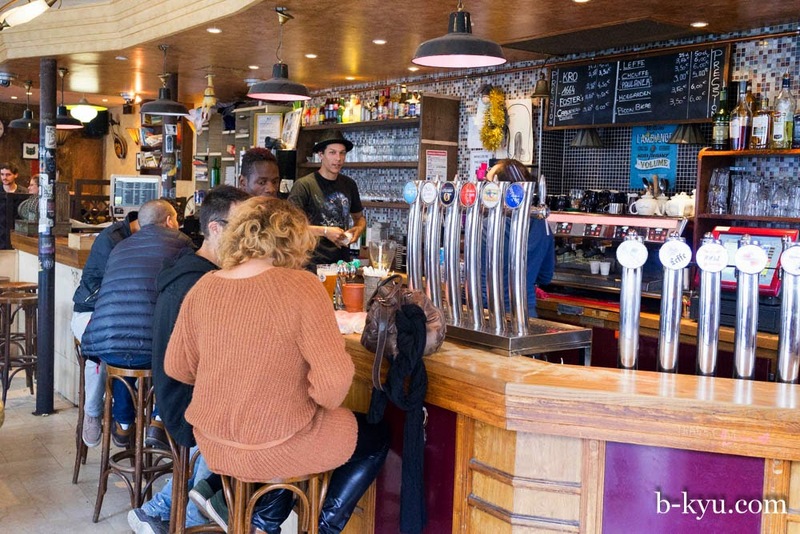 After scouting out the eating possibilities, we stopped for a beer at the Bar Le Chateau D'Eau, on the corner of Faubourg Saint-Denis (by now we had renamed the street rue Dennis Lillee) and Chateau D'Eau. This was our favourite pub in Paris. A spot by the window and a couple of pints of Kronenbourg and we were in heaven. 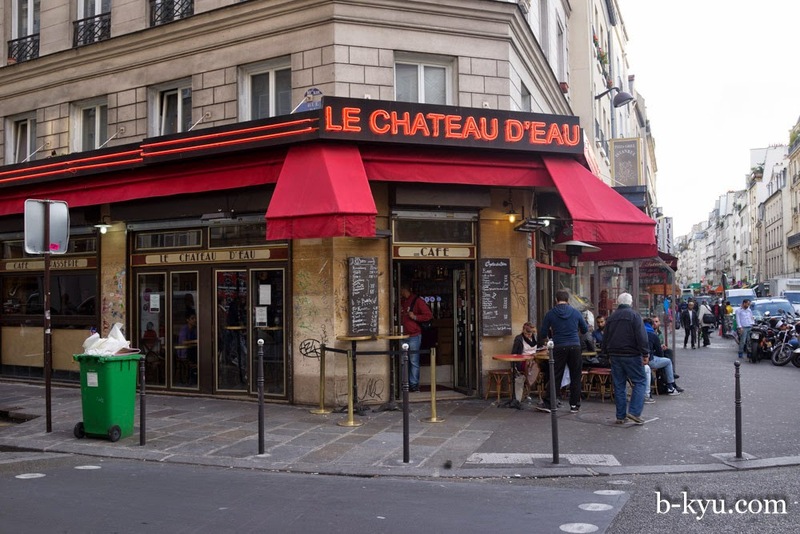 Le Chateau D'Eau is the United Nations of drinking holes. There's a mix of barflys, locals popping in for a quick glass and the sounds coming from the bar stereo made it a supremo spot for people watching. If the mix of food on the street was great, finding a bar where we felt comfortable and the price for beers was right was an even bigger bonus. The view from the barstool, facing north. From here we watched people walking home from work and school, incredible feats of parking, arguments over blocked roads by delivery vans, cyclists idly crossing the city away from the busy main roads, racks of clothing delivered (the street is close to the rag trade district) and the owner of an African market standing in his doorway, bored and waiting for business. 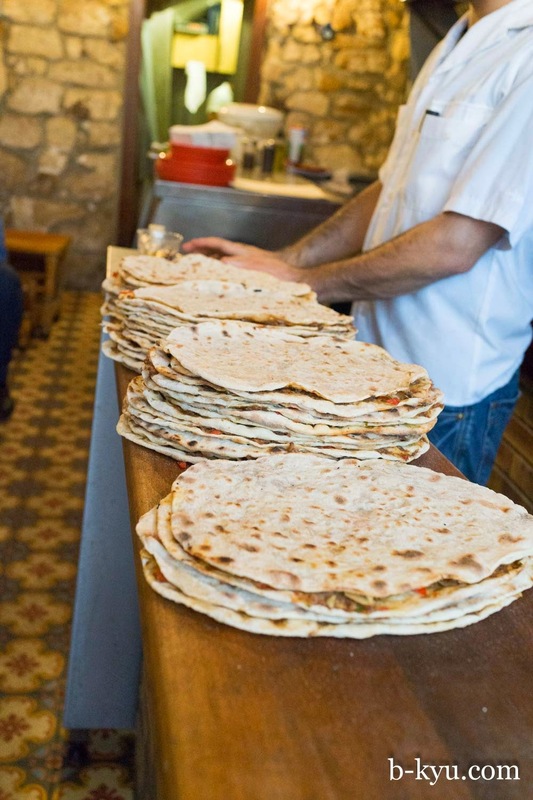 After beers at the bar, Urfa Durum was our choice for some Kurdish cuisine. 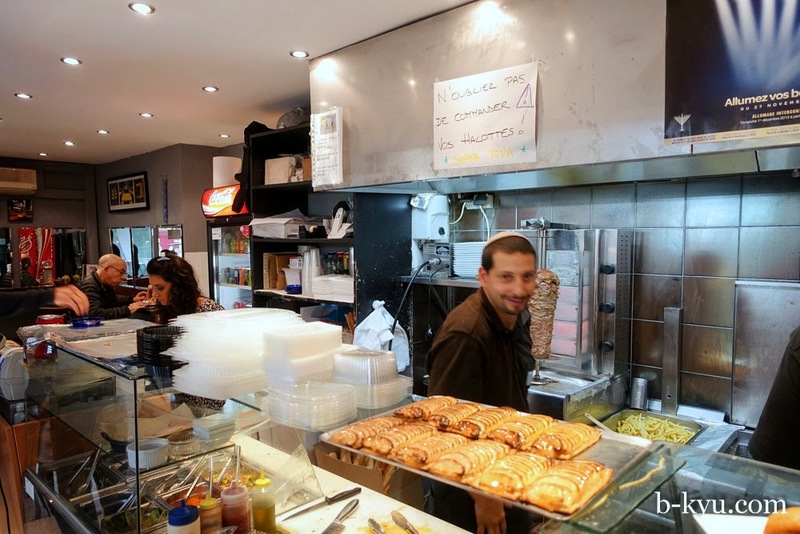 This small sandwich bar was busy turning out kebab like rolls filled with grilled meats and salads. The feel of the place was exotic but the tiny chairs out in the street were hell to sit on. The bread was fresh made inside, a thin wheat flour bread, tortilla like, rolled up with grilled marinated meat and just some basic tomato and lettuce, no sauce. Small menu, we went for the agneau (lamb) and a foie d'agneau (lamb liver). 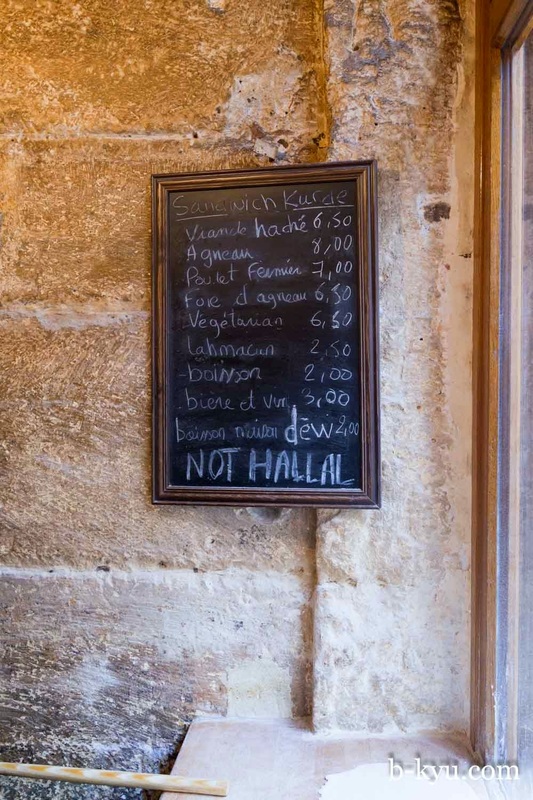 The sign makes a point that this place is not halal, which also accounts for the biere et vin (beer and wine) availability. Piles of fresh made bread from the ovens inside. Sandwich innards, fresh grilled meats and a light salad base for moisture. Great post Le Chateau D'Eau food. 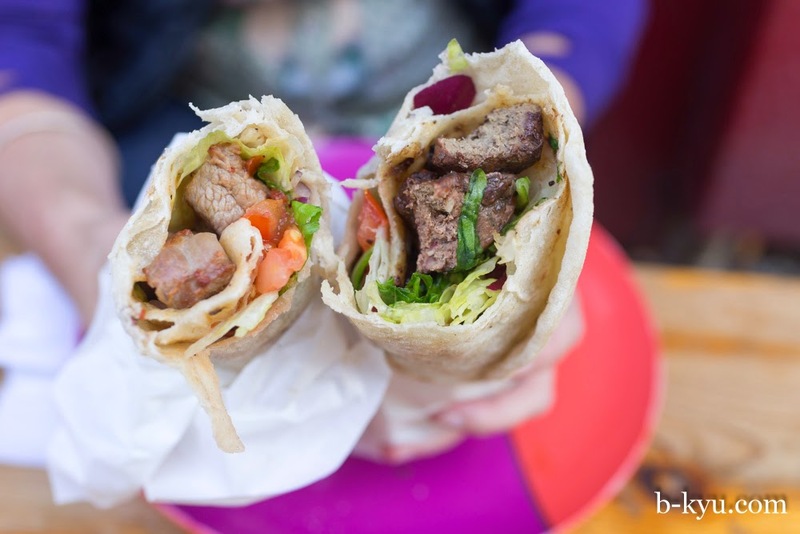 These were so simple yet so fresh and so perfectly cooked, they blew our minds, reminding us of one our very favourite joints in Sydney, Kebab Al Hojat. This street was such a joy to be in, to us it felt like Merrylands. 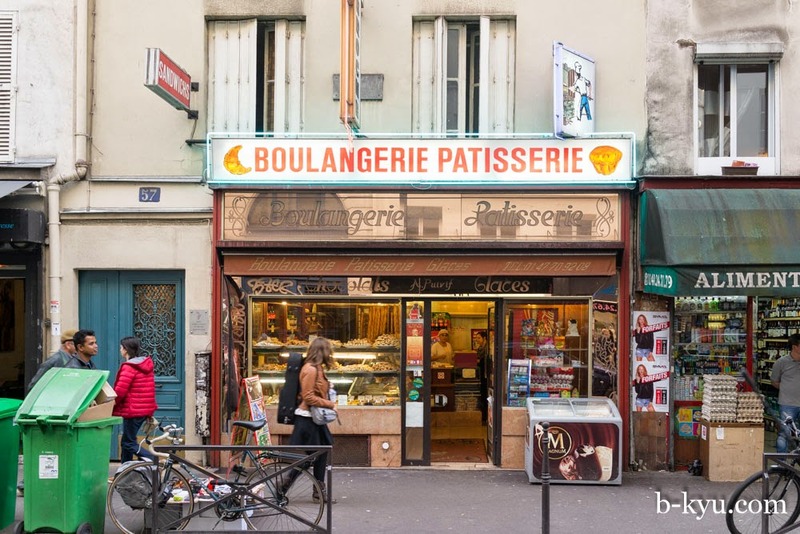 We felt far more comfortable than we did after walking through the Surry Hills-like streets surrounding the too-cool-for-school Frenchie To Go. Pulled pork rolls, meh. Beautiful ye-olde champagne shop and deli. Bread stores, delis, grocery stores, cheap fruit and veg stores, cake shops, everything was here. 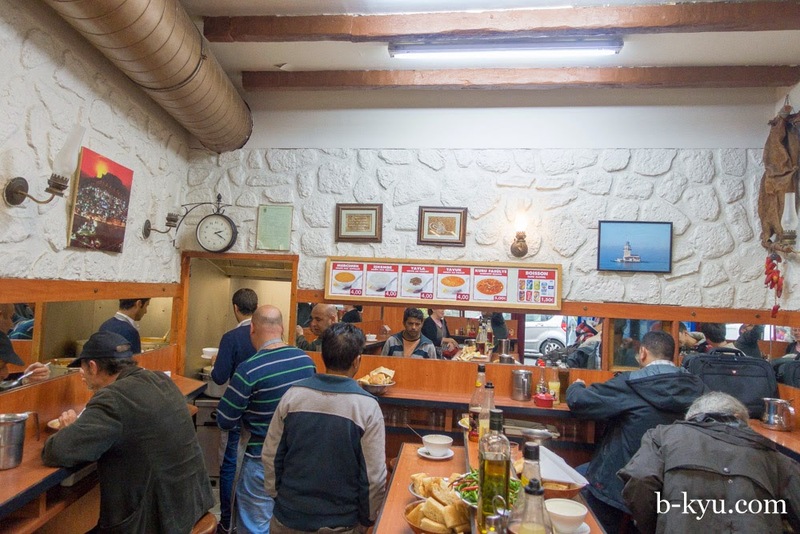 This small hole in the wall joint with room for only a dozen punters inside and out was our next obsession. Filled with a mix of Turkish blokes and students coming in for soup, which was all it sold. We wander inside with our usual wide eyed haven't got a clue what to do look so when the waiter speaks English and is super friendly and helpful we feel welcome. Looking at the board at the back of the store, there are only five soups on the menu: lentil, chicken, tripe, yoghurt and haricot (white beans). After we order, the waiter helped us out suggesting which condiments to eat with each soup, and wisely suggested not filling up on the help yourself baguettes, which was a good tip because we had enough room to order seconds. 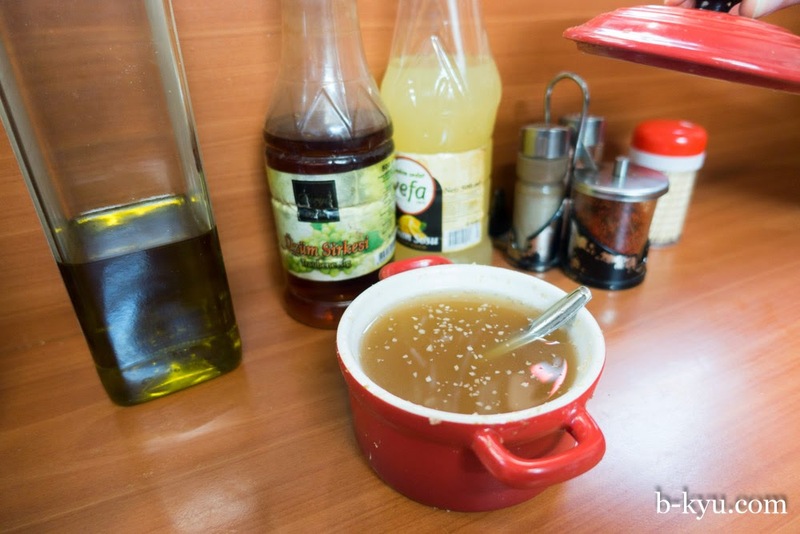 The red pot was filled with lemony garlic sauce to ladle into the soup as you desired, or add extra olive oil, lemon juice or chilli. Shawn goes for a lentil soup upon the waiter's recommendation and it's wonderful, simple food perfectly done, like a really good soupy dhal without the spices. It was so good Shawn ordered this again on a second visit. Add a little lemon, olive oil and chili powder if you wish. Only €4. 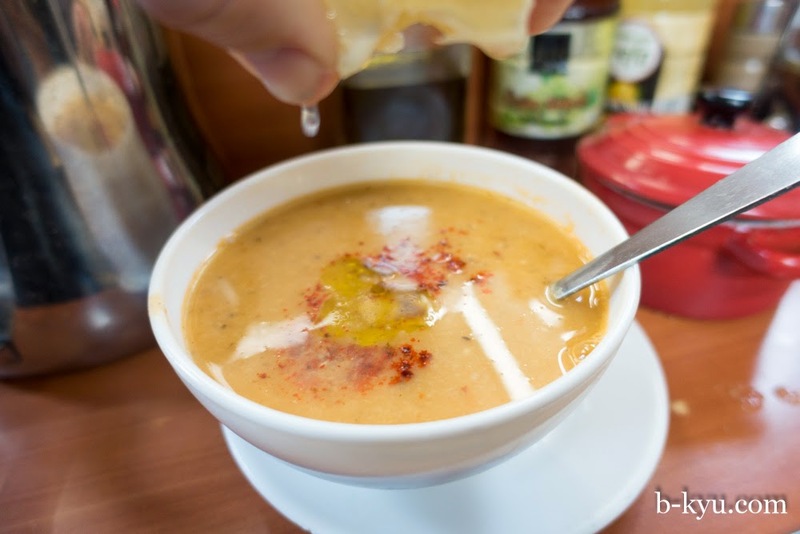 The prices for the soup also include as much bread as you want, no wonder this place is popular with students. Alison goes for tripe soup (€5) which is white, we assume with a yoghurt base, and funky chunky bits of animal innards, add a touch of lemon and some of the garlic for a huge flavour hit. The soups are so good we order seconds. The chicken soup was plain and would be perfect if you were off colour. Some strings of chicken flesh pad it out and rice makes it heartier. 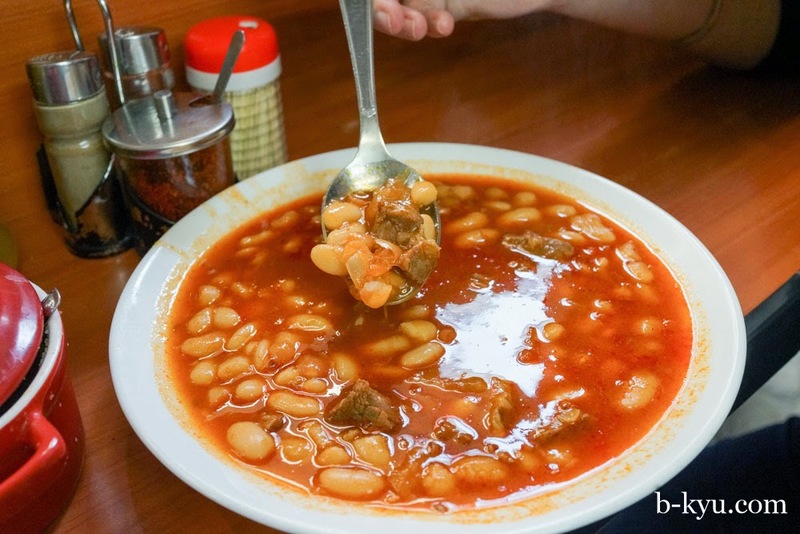 Haricot soup was like a plate of the best baked beans we've ever had, with some skerricks of lamb for extra flavour. The food was filling and fairly healthy, nice to feel revitalised rather than sleepy as we often did after a good French feed. 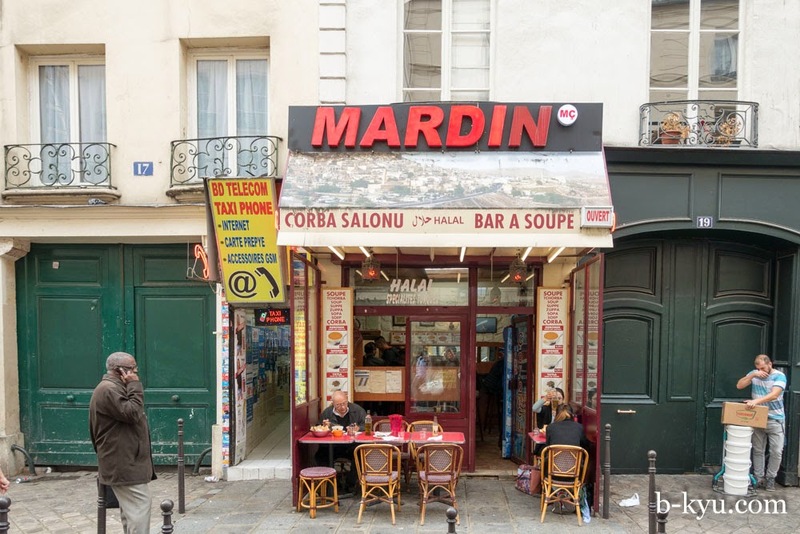 Mardin Corba Salonu is at 19 rue de Faubourg Saint Denis. There's a number of small arcades or 'Passages' that twist and turn through the back streets. Not as glamorous or as famous as Passage Jouffroy, Passage de Cairo is a rag trade thoroughfare with shops selling showroom dummies, buttons and zippers to the trade. 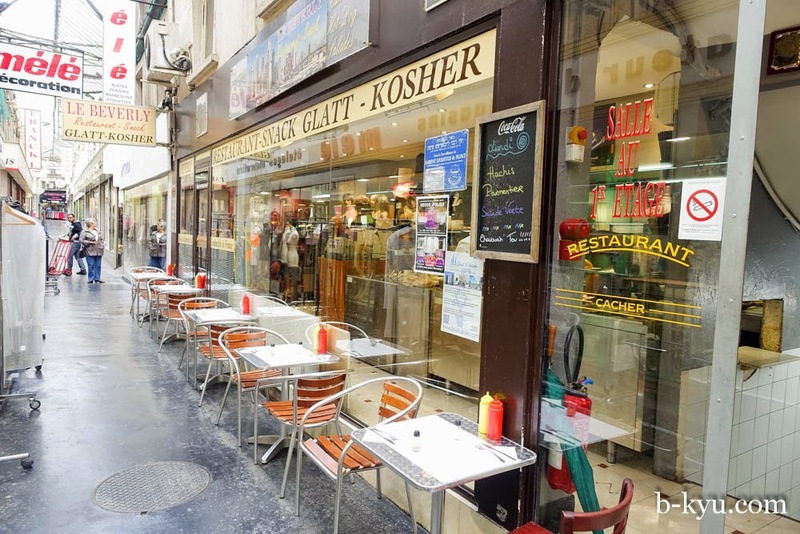 Walking through we came across 'Le Beverly', an Israeli snack bar and restaurant. The staff inside are busy pumping out meat and salad filled rolls to workers who need a quick lunch. 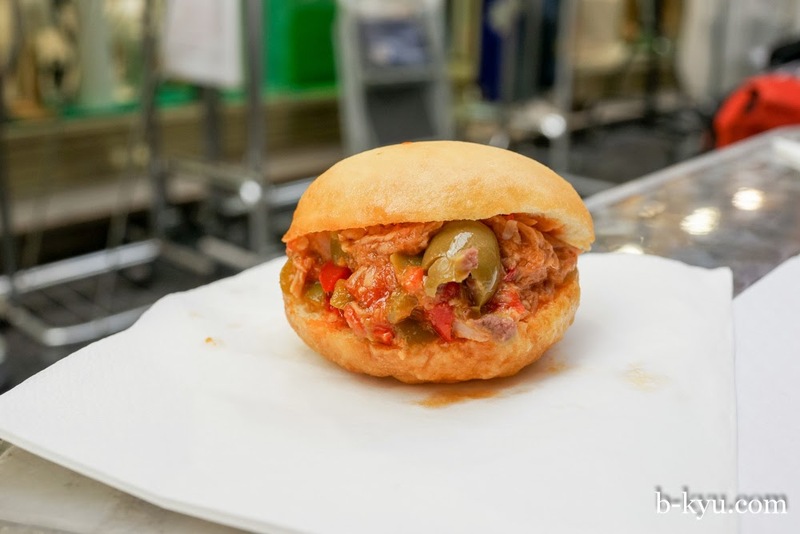 We are on our way to bigger eats, so we just have a taste of one of their small soft buns filled with tuna and olives, mixed with a little tomato paste, about 1.80. 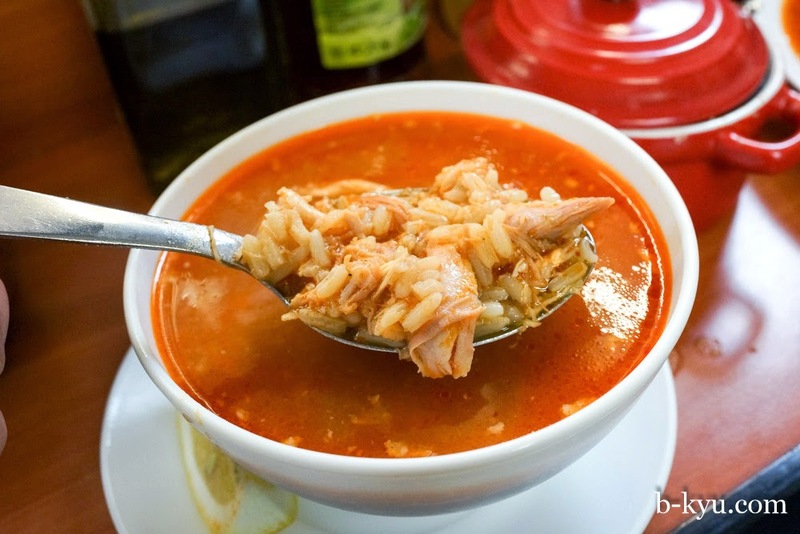 Filling is similar to the Maltese classic sandwich hobz biz-zejt, tangy, salty and satisfying. It was also similar to the Tunisian sandwiches we had later in the trip. 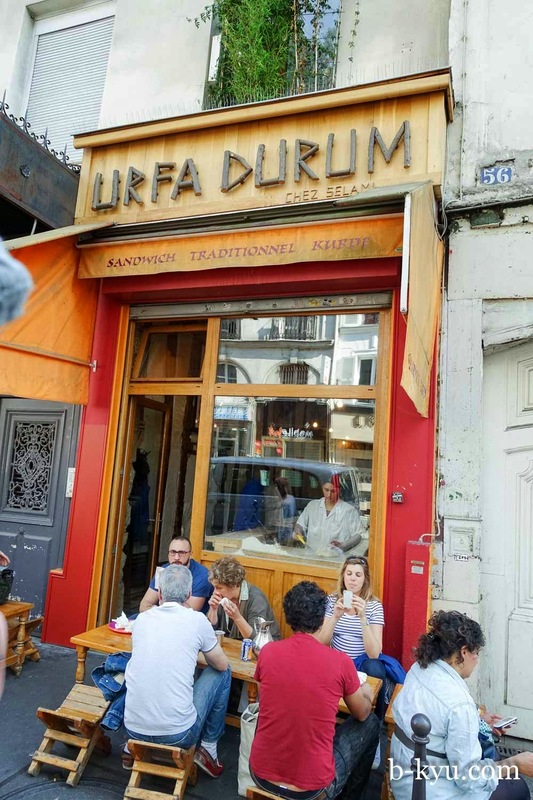 "We wandered the streets looking for something a little Frenchy and fancy, with a fallback plan of Turkish at rue Fauborg Saint-Denis. All the French places we passed were samey - steak, cheeseburger, salads etc, few have the creamy French sauces or interesting cooking we were hoping to find. Perhaps because people don't want super fancy for lunch, there were queues outside hipster burger and bagel places that seemed to be the most popular lunch feeds. 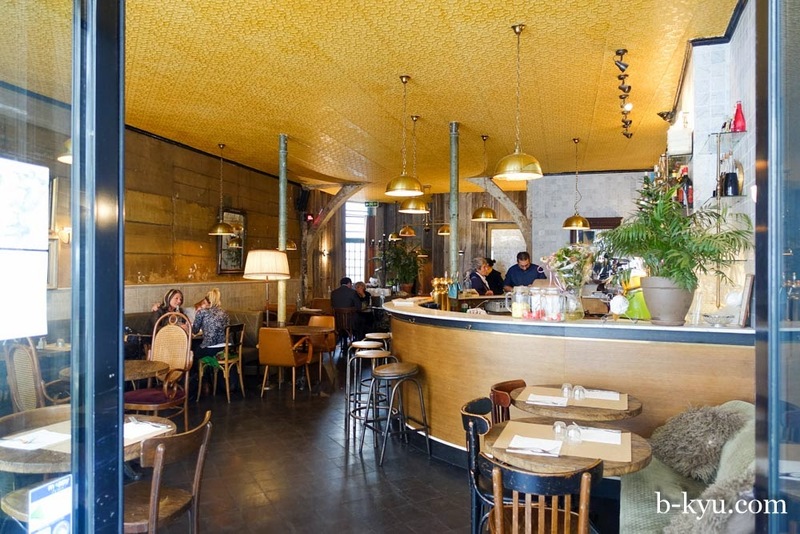 Is the French art of lunching getting killed by trendy burger joints? Finding just the right spot can be hard when you want a lunch to remember. 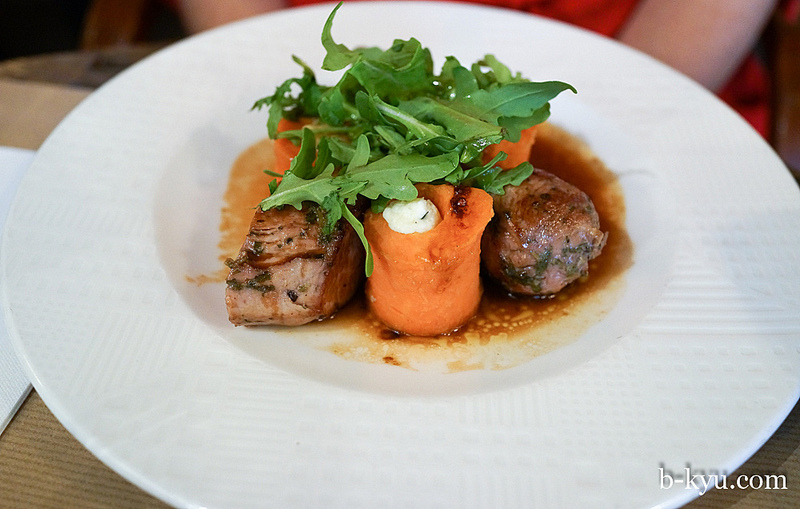 Who would have thought it would be hard to find French food in Paris? What is French food or Parisian food anyway? Everything is so global these days. There comes a point where the restaurant hunt gets painful, the indecision hurts more than your feet, we get the low blood sugar shitties set in and you never know when to give in or keep going. But it always pays to keep going. 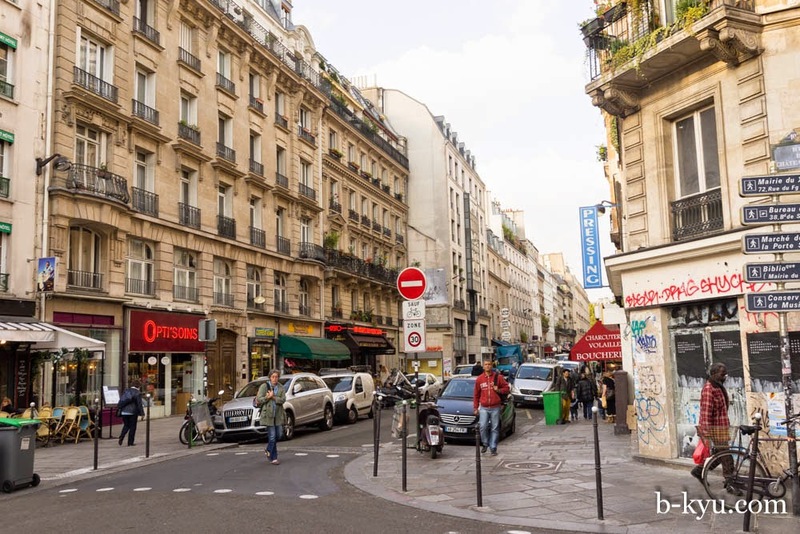 By the time we waddled around looking for lunch we ended back up on Saint-Denis (it had a weird calling) and decide schlep it with some Turkish sandwiches. 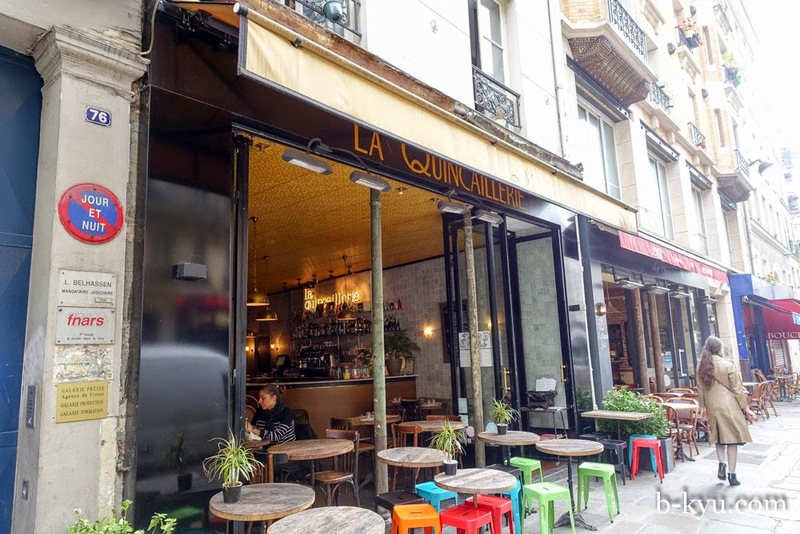 Then we find a couple of mildly upmarket modern French places, settling on La Quincallerie, which seemed the more relaxed of a few newer boho style eateries." Anyhoo, the restaurant is pretty groovy by our standards but the staff are pretty relaxed and there's beer on tap, we're comfy in a jiffy. We're excited by the slightly more fancy food here. It's like bistro food taken up a notch. Alison loves her piggy pink in the middle pork and especially the carrots stuffed with potato. They grow fine swine in France and this is a lovely strong-flavoured fillet of the stuff. 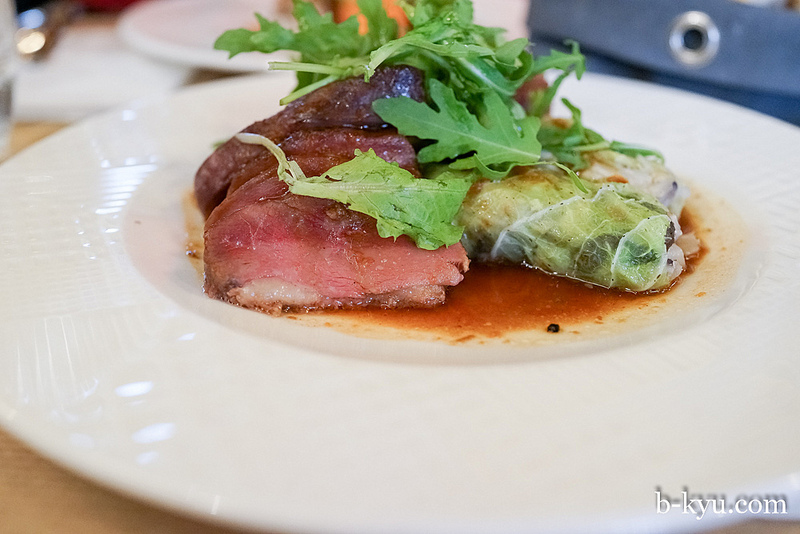 Shawn fell head over heals with magret de canard (duck breast) and had to force himself not to order it at every single opportunity. The duck is gamey, unlike Australian duck, and it really works with the lovely joiux. It's pink in the middle and tender with a rare roast lamb texture. To the side are two rolls of shiitake mushrooms with nuts rolled up in cabbage leaves. 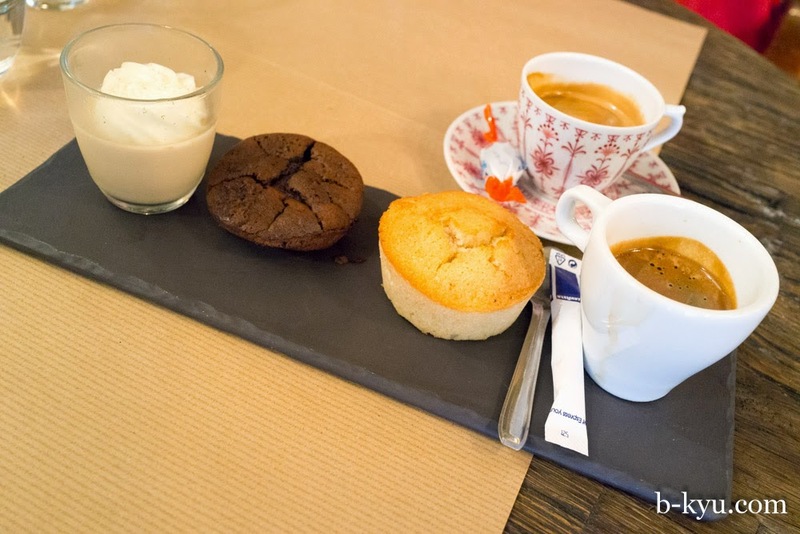 Cafe gourmand to finish. Espresso shot with a rack of three small deserts: coconut cake, rich dark chocolate cake, and a shot glass of coffee or maybe hazelnut mousse. All great but there can only be one winner which is the coconut cake. La Quincaillerie is at 76 rue de Faubourg Saint-Denis. Shawn loves plain cake. And Paris.